Let’s Make a Silk Top Hat! Here is the tutorial, as promised, for making the silk top hats from my riding habits and the new L’habitude en Soie Grise. I used the book ‘The Art of Making Miniature Millinery’ by Timothy Alberts as a reference. This is a great book to have along with his ‘The Art of Making Beautiful Fashion Doll Shoes’. I have used both these books as reference in my OOAK designs. SO to start-first you need to come up with your pattern and shape of hat. Sorry I am not providing a pattern for this as all dolls have different sized heads. There are basic parts of a hat: the brim, which is the outer part that usually protects our faces from the sun, and the crown. 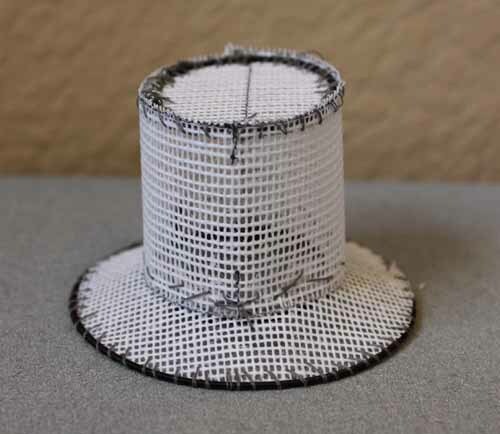 This hat is in three patterns-a crown consisting of the top connecting to a band, and the brim. Measure your dolls head to determine how large you band will be. 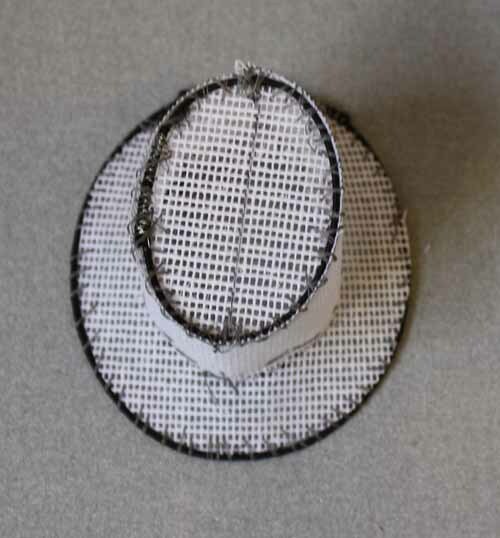 Add about an 1/4″ to 3/8 for extra room of the wire and fabric if you want it to fit down around her head. Make sure you do the measurement with her wig on if she wears one. Cut a rectangle out of brown paper of this measurement length plus 1/4 seam allowance by however high you want the hat to stand. 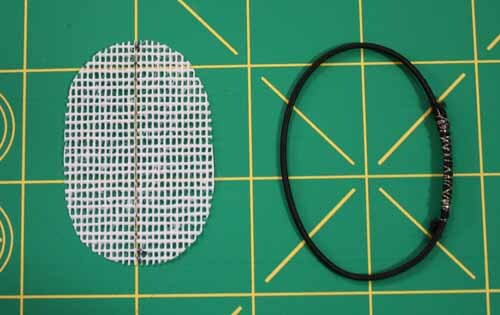 Now whatever the circumference is of this band, you will cut either a circle or oval for the top of the crown (cut it slightly smaller to allow for the wire sewn around it. I used an oval shape. The brim will have a circle (or oval) cut out in the middle and then the desired width of the brim cut around. (On the inside of the brim you will need to add a seam allowance for sewing it onto the band) I used a center back seam on mine to make my brim curve up a little bit before shaping the wire after it was completed. 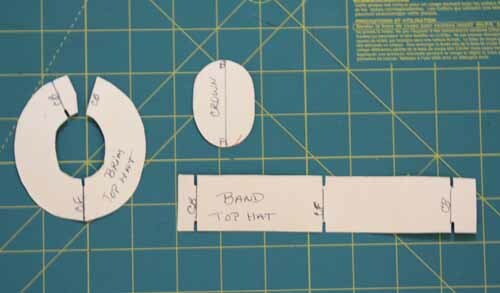 All these pieces should be cut out of brown paper first so you can tape it together to determine your hat shape will work. No pics of this as I had an existing pattern I used. Millinery Wire-19 to 22 gauge works well. You can purchase this at either place above. Tie Wire-a very thin wire used to join the millinery wire into the shape of the hat. The buckram does have a grain, cut out pattern with grain up and down. 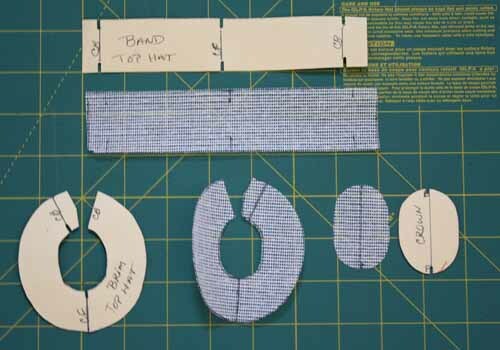 Cut out pattern pieces once the hat pattern is complete with fitting and seam allowance. Mark center fronts and backs. Spring your wire and shape around the tip or top of the crown. connect together using the tie wire. 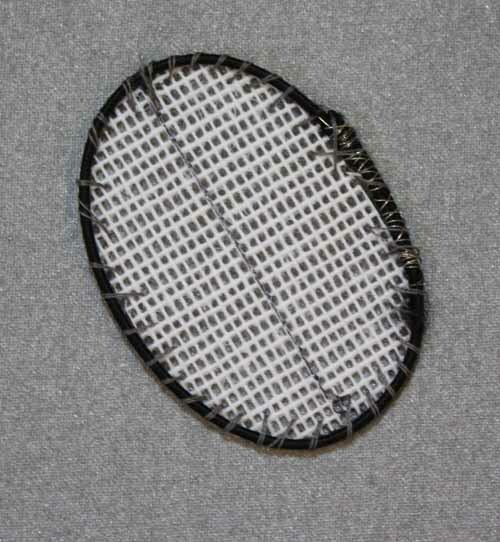 Using double thread with thread conditioner, slip stitch the wire around the outside edge of the top buckram piece. Now stab stitch the center back seam of the band. Make sure it fits smoothly around the tip with the wire. 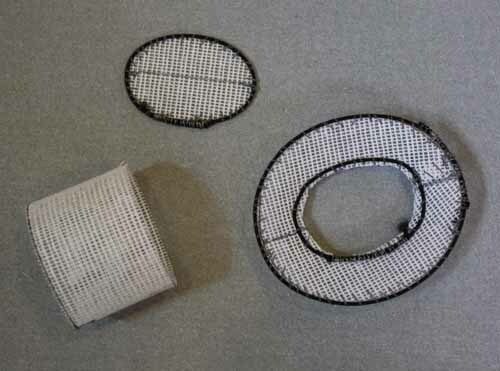 Measure the wire around the outside of the brim, join together using tie wire. Do the same for the inside of the brim along the seam allowance. Slip stitch the outside brim wire around the brim; stab stitch the inside wire to the underside of the brim along inside line (the seam allowance will be clipped and turned upward-away from the wire to be connected to the band). Now comes the fun part where your hat will actually start taking shape. Slip stitch the band to the top or tip(as in millinery talk) matching your CF and CB. Now we are going to bind the edges of the hat to cover the wire. Take your bias cut muslin strips and gently stretch one strip around the tip and band- cut to size. Using Sobo glue glue this strip around the tip and band to cove the wire. The bias cut should make it to kind of fold over the edges when stretched. The mulling process begins-you don’t necessarily need to do this part, but I think it makes for a much smoother surface of the hat. Cut out of your flannel: one tip, one band and two brims with no seam allowances. 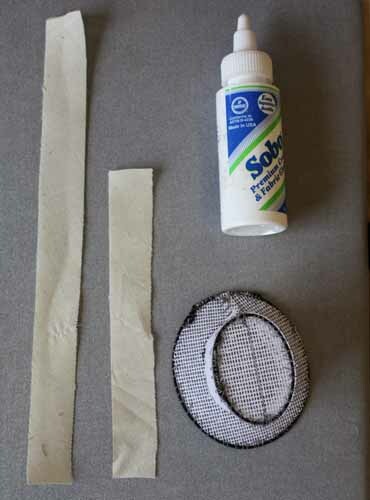 glue these to their corresponding buckram pieces to cover the hat nice and smooth. It can get a little messy with the glue. Out of your fabric you will cut a tip with SA and two brims with SA. The band will be cut on the bias with seam allowance all around. 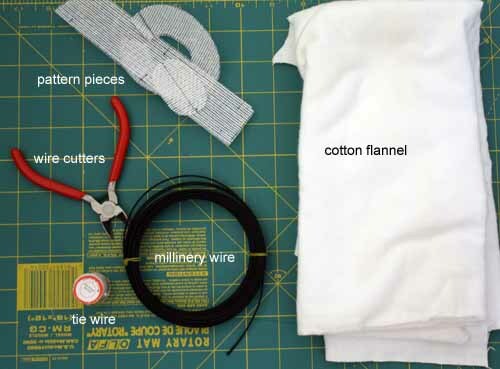 Sew a running stitch around the top piece of fabric. Place it on the top of the hat and pull the stitches so it conforms around the top of the hat. Smooth it out on the top and stab stitch in place through all thicknesses. The brim will be sewn on-the top first. Stab stitch it to the base of the band through all thicknesses-curve the edges over to the bottom of the brim. A running stitch will again make this process easier. Slip stitch it underneath to the flannel. The bottom piece of the brim will be stab stitch around the base of the band again thorugh all thicknesses and then the seam allowance will be turned under and a very small invisible or slip stitch will sew the edge to the top part around the outer edge of the brim. Look above at picture. Now I was in a hurry to get this hat finished for the challenge so I failed to take pics of the rest. 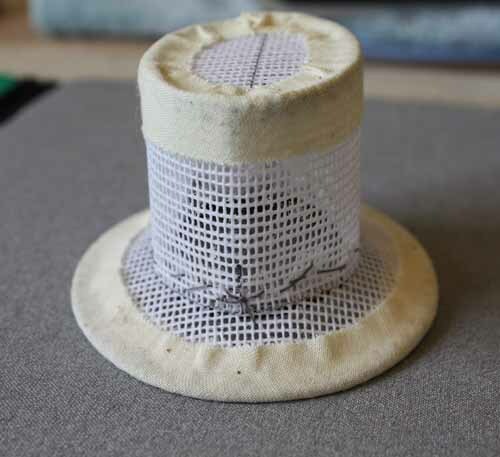 The band will be fitted around the band of the hat-press under the seam allowances on both long sides- fit it around the hat and mark the seam. Stitch and turn right side out. Very carefully fit it over the hat into place around the hat band. 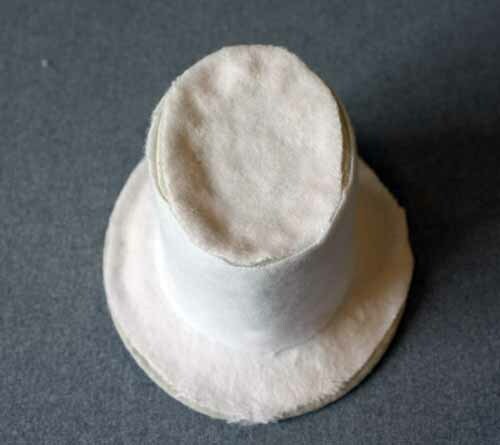 the lining is pretty basic, out of silk or cotton sew one tip and band together to make an inside lining- place inside hat and stab stitch in place along with the bottom of the band around the base of the hat. Glue a piece of grosgrain ribbon around the inside edge to cover stitching and finish it off. On the outside glue your ribbon around the base and add trims to your desire- use Fabrictac glue for this. Shape the brim as desired- I turned mine up like a top hat has. Voila! your hat is complete. 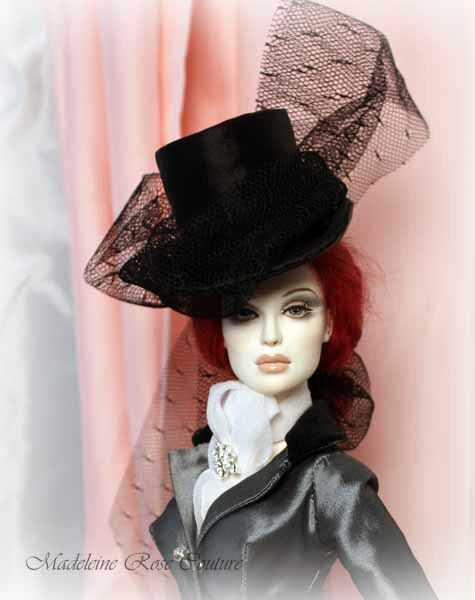 You may need to use small pins to keep hat on doll’s head. This hat is one of your masterpieces. This is fabulous, thank you for posting it. 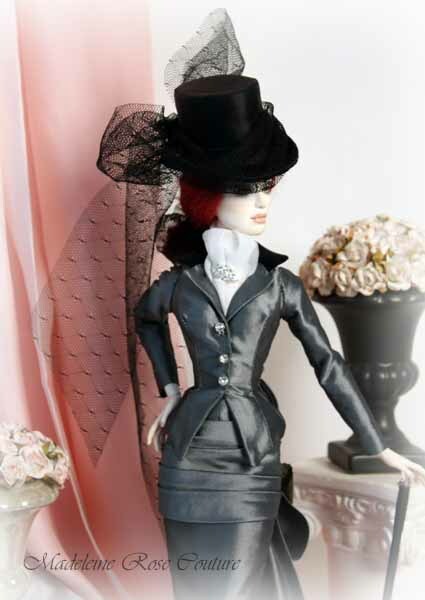 I’m getting into Steampunk and want to make my own leather-covered Victorian Ladies’ Riding Hat…this is absolutely wonderful for me to learn from…thank you very much! I stumbled onto your website by accident, I must say, YOU BLEW ME AWAY! Awesome! How did you get into doing this type of hobby??? Thank you so much for this tut, its just what I’ve been looking for! AWESOME!!! I’m also going to look up the shoe making book you referenced, I was thinking today about trying to make my own doll shoes as the selection is so limited. Thanks so much for sharing this! You’re welcome Noelle. And best of luck with your future doll endeavors! Wow, this is just what I was looking for to make a costume piece for theater- I’m going to adapt this recipe to human size. Thank you so much! Thanks Rachel! Would love to see how it comes out. This site is great for millinery supplies. 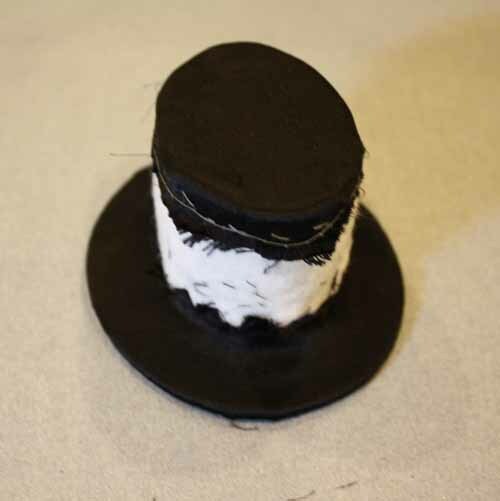 I was looking for an idea how to make a top hat for a child – like a magician. Now that I’ve seen how cool the structure is and your artistic website I will have to share with others. Thank you for sharing your hat pattern, I’ve been trying for ages to make one, now I can. Another style to add to my own. Deep joy, thanks Steph.